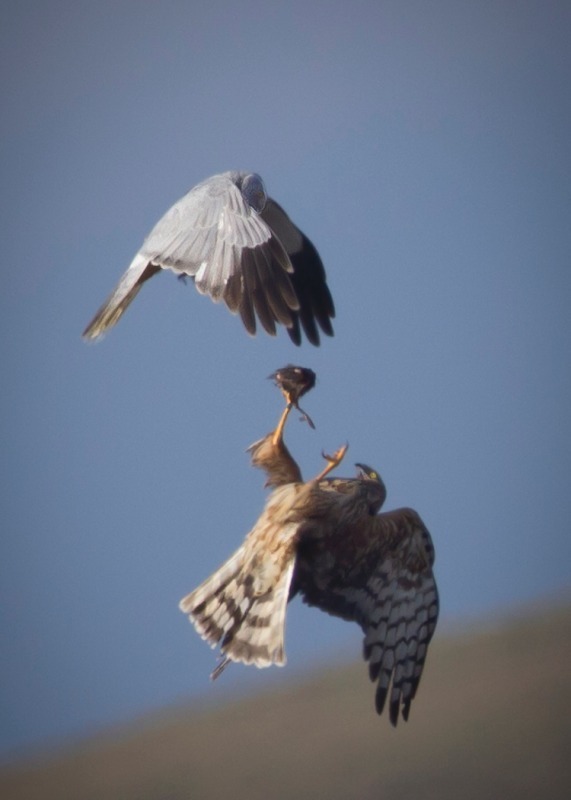 Hen harriers pass food during courtship. You'll have seen, I know, Raptor Persecution Scotland's letter to you following the slaughter of yet another hen harrier in Leadhills. Raptor Persecution Scotland are a gentle and polite body, and pull their punches rather dramatically. This all sounds very grand, but the outcome amounts to nothing. Vicarious liability prosecutions are quietly dropped. General Licence restrictions, where applied, are replaced by specific licences licencing all those things the estate owners would have wanted to do under the general licence anyway; and SNH are unable to impose any further General Licence restrictions because Police Scotland will not co-operate. A report is a good thing. I'll allow you some praise for the report; but even this is of little worth if no action follows. Penalties are of no worth whatever unless there's some prospect of their being imposed. Yet despite the clearest possible evidence, the Crown Office have repeatedly failed to even bring crimes before the court. As to the satellite tag data, the review is nothing more than prevarication. I know, you know, the world knows where these tags a mysteriously disappearing. They are mysteriously disappearing on Scotland's 'sporting estates'. Furthermore, they are not disappearing equally on all of Scotland's 'sporting estates'. There are some estates - and we could both name them - on which tags disproportionately mysteriously disappear. I appreciate that many large landowners are very powerful people, with great influence both nationally and (especially) locally. I appreciate they have many ways to bring leverage to bear which are less blatant than simple cash payments. But for any officer of the state - whether they be a police constable, a Crown Office lawyer, or a Cabinet Secretary - to turn from their duty in response to either subtle inducements or subtle threats from powerful people - is corrupt behaviour, and it cannot be acceptable in Scotland. You cannot, of course, force either Police Scotland or the Crown Office to do their duty (although it might be hoped that some of your cabinet colleagues can). But there is action which the law empowers you to take which would cut through this mess like a hot knife through butter. The Land Reform (Scotland) Act 2016 gives you the power to designate land as environmentally detrimental, allowing community interests to force the purchase of that land. What could be more clearly environmentally detrimental than land on which protected species frequently die? The Scottish National Party exists to achieve independence for Scotland. To persuade people to vote for independence for Scotland, you must persuade them that an independent Scotland will be a better place - a more equitable, more just place - than it is at present. Saying, as the SNP did during the 2014 referendum campaign, that we can have independence and nothing will change, will not cut it - as the 2014 referendum proved. We have to offer a vision of a better nation. A better nation is not one in which six hundred people own half the land. A better nation is not one in which the powerful can break the law with impunity. A better nation is not one in which our uplands are turned into a blighted desert for the recreation of a tiny minority. A better nation is not one in which the glens are empty of people. A better nation is not one in which the selfish few can slaughter our wildlife. Be brave, Roseanna. Tell the lairds that if raptors die on their estates, you'll take the land off them. You can. The law empowers you. And Scotland demands it of you. Leadhills would be a fine place to start.